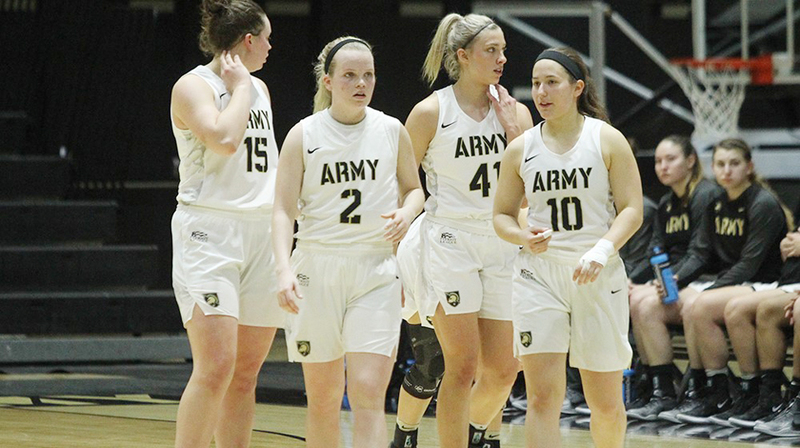 he Army West Point women's basketball team had a six-point lead at the half, but Lehigh started the third quarter with a 15-2 run and earned the 73-50 win on Saturday afternoon. WEST POINT – The Army West Point women’s basketball team had a six-point lead at the half, but Lehigh started the third quarter with a 15-2 run and earned the 73-50 win on Saturday afternoon in Patriot League action at Christl Arena. Madison Hovren led the way for Army with 15 points and 18 rebounds for her 14th double-double this season. Kate Murray contributed with 10 points, while Sarah Bohn had nine. Lindsey Scamman had four points and nine rebounds and Jess Lewis finished with three points, three rebounds and five assists. Lehigh saw four players reach double figures with Camryn Buhr scoring 15 on 7-of-10 shooting from the floor. Overall, the Mountain Hawks saw nine different players hit 3-pointers in the game for a total of 13 on the day. They shot 54 percent from three, including 11-of-13 (84.6 percent) in the second half to erase Army’s halftime lead. The teams traded buckets for the first five minutes with Bohn and Murray hitting 3-pointers from the top of the key, while Hovren added a layup, but Lehigh led 9-8 with 4:38 on the clock. Army’s three-point shooting continued with Morgann Yancey and Murray hitting from the outside during the quarter. The Black Knights had the 16-15 lead after Alisa Fallon found Hovren for a layup at the buzzer. It was a low-scoring second quarter with Army putting up 14 points to Lehigh’s nine as the Black Knights took a 30-24 lead into the break. Hovren finished with seven in the quarter and had 11 points and 12 rebounds at the break. Army was 5-of-10 from three in the first half and Bohn hit her second of the day with a minute left in the frame. Then Fallon hit a jumper to give Army its biggest lead at 30-22, but Lehigh answered with Buhr knocking down a short jumper to make it 30-24. Lehigh turned it on out of the break with a 15-2 run in the first 5:29 of the third quarter. The Mountain Hawks hit three-consecutive 3-pointers and led 39-32 with 4:31 on the clock. Buhr had four points during the run, while four others contributed with points. The Mountain Hawks outscored the Black Knights 28-10 in the frame and took a 52-40 advantage into the final quarter. Megan Walker led the way for the visitors with eight points in the quarter. Lehigh was 5-of-7 from distance in the quarter, which allowed the Mountain Hawks to extend their lead. Lehigh’s hot shooting continued in the fourth quarter as the Mountain Hawks were 6-of-6 from distance in the frame. Army got to within eight at 52-44 with nine minutes left, but answered with three-consecutive 3-pointers with two coming from Hailey Pascoe. The Mountain Hawks ended up with the 73-50 victory and outscored Army 21-10 in the final quarter. The Black Knights are back at Christl Arena on Wednesday night against Colgate.